Mass air flow sensor is removable under the car-mounted condition. Remove engine room cover. Refer to EM-24, "Exploded View". Remove air duct inlet (upper). Remove air cleaner filter from the air cleaner cover. 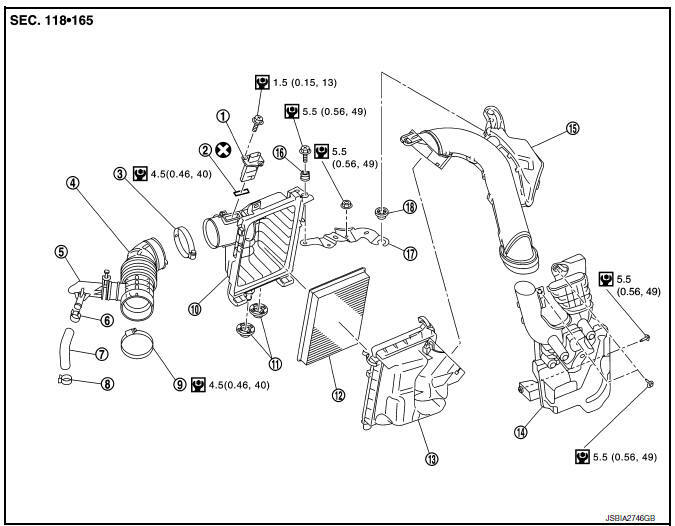 Disconnect mass air flow sensor harness connector, and remove harness clamp from air cleaner body assembly. Disconnect PCV hose and transaxle breather hose. Remove air duct (suction side). Add matching marks if necessary for easier installation. Remove mass air flow sensor from air cleaner cover, if necessary. Handle the mass air flow sensor with following cares. Do not shock the mass air flow sensor. Do not disassemble the mass air flow sensor. Do not touch the sensor of the mass air flow sensor. Remove air duct inlet (lower) with the following procedure. Remove front combination lamp (LH). Refer to EXL-119, "Exploded View". Remove air duct inlet (lower). Installation is in the reverse order of removal. Align marks. Attach each joint. Screw clamps firmly. Tabs shall be fixed after inserting air cleaner body assembly protrusion to air cleaner case notch hole. Make sure whether air cleaner body has been firmly installed by shaking it. Inspect air duct (suction side), air duct inlet (upper), air duct inlet (lower) and resonator for crack or tear. If anything is found, replace air duct (suction side), air duct inlet (upper), air duct inlet (lower) and resonator.